The NERC MST Radar site (50 m above mean sea level, 52.42°N, 4.01°W; British National Grid Reference SN 637 826) is located within an east-west aligned valley, which rises up by 100 m on the north and south sides. Since this can have a significant effect on the low-level winds, surface wind measurements are made from Frongoch farm (140 m above mean sea level, 52.42°N, 4.05°W; British National Grid Reference SN 604 826), which is located 3 km to the west of the radar site. Between 9th November 1995 and 28th November 2001, the instruments were mounted on a 5 m tower. 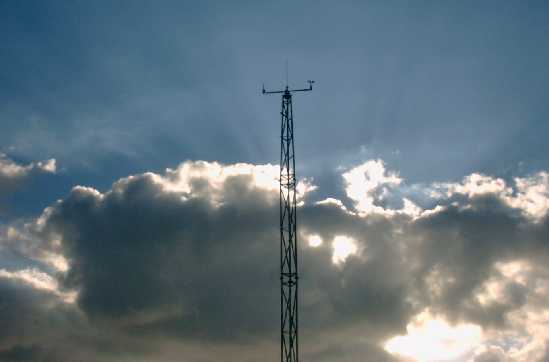 Since 19th December 2001 they have been mounted on a 10 m tower (pictured). There is an error in the wind directions in the old format files for data between 9th November 1995 and 28th November 2001. Although the directions are nominally given in the meteorological convention, i.e. FROM which the wind is blowing, they are actually "mirrored" about the North-South line, i.e. This error will be corrected when the data are transferred to NASA-Ames format files in the near future.